Wow, the farmer’s market still has strawberries. Wasn’t expecting to have them all winter long. This was dessert tonight, and I’d definitely make it again. 2. Adjust oven rack to lower middle position; heat oven to 425 degrees. Mix flour, salt, baking powder, and 3 tablespoons sugar in food processor, pulse to combine. Add cold butter that has been cut into half-inch pieces and continue to pulse until the mixture looks like coarse cornmeal flecked with pea-sized bits of butter. Pour the mixture into a bowl; stir in the egg and half-and-half with a rubber spatula until the mixture comes together. 4. Pat dough into 9- by 6-inch rectangle, 3/4 inch thick. Cut dough into six pieces (original recipe says to cut into 2 3/4″ rounds, but I don’t own a biscuit cutter). Place 1 inch apart on small baking sheet; brush dough tops with egg white and sprinkle with remaining sugar. (Can be covered and refrigerated up to 2 hours before baking.) Bake until golden brown, 12 to 14 minutes. Place baking sheet on wire rack; cool cakes until warm, about 10 minutes. Wing, this looks wonderful! 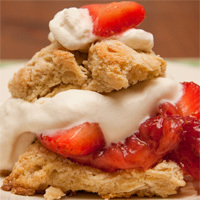 I’ve never thought of making shortcakes myself. These look so different from the ones you buy at the store. While those are more like a cross between yellow and angel food cake, yours are like delicious buttery biscuits!